Junior Jalen Hurts finished 5-of-9 passing for 70 yards, with another nine yards rushing on three carries. Tua Tagovailoa, sharing quarterback duties, stood out with 227 yards on 16 passing attempts, plus 26 yards and a touchdown on the ground. Taylor’s question is not obviously intended to get Saban to dump on one of his quarterbacks. At best it’s an attempt to demystify Saban’s rationale for refusing to land on one or the other as his official starter; less generously, it’s a prompt for Saban to issue some boilerplate about we like what both men give us and we like to keep the defense guessing. Saban turned it into an intense little drama about media controversy-mongering, because he’s a paranoid dickweed. 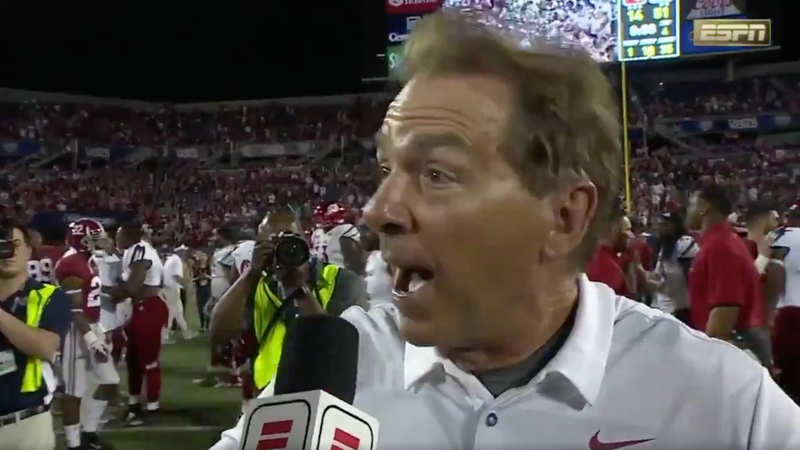 ESPN confirmed to Deadspin Sunday that Saban did, in fact, call Taylor later Saturday night to apologize for jumping down her throat, as first reported by Jim Miller. It’s probably too much to ask, at this point, that Saban stop acting like a damn tyrant all the time.